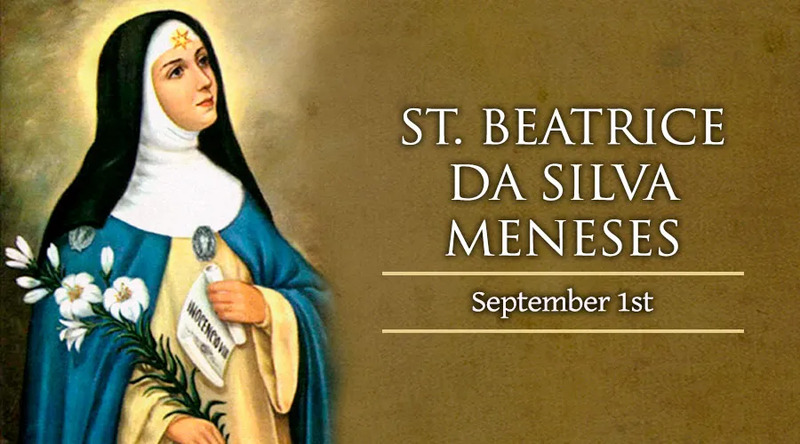 St. Beatrice was born to Portuguese nobility in Cuerta, Portugal, in 1424. She was the daughter of the Count of Viana, and the sister of Saint Amadeus of Portugal. She was raised in the household of the future Queen Isabel of Portugal and spent some time in her royal court in Castile following the Queen's marriage to John II. She soon got tired of the empty life at court and joined a Cistercian convent in Toledo. She lived at the convent until 1484, when she answered a summons from God to found a religious order. The Congregation of the Immaculate Conception of the Blessed Virgin Mary was begun, and with the help of the Queen, she founded a house outside of Toledo where she lived and served as superior until her death on September 1, 1490. Saint Beatrice was canonized in 1976 by Pope Paul VI.